Veeco Instruments Inc. (Nasdaq:VECO) introduced today the new TurboDisc(R) EPIK700TM Gallium Nitride (GaN) Metal Organic Chemical Vapor Deposition (MOCVD) system that combines the industry’s highest productivity and best-in-class yields with low cost of operation, further enabling lower manufacturing costs for light emitting diodes (LEDs) for general lighting applications. 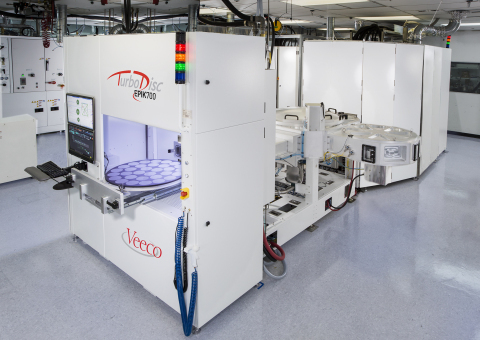 Based on Veeco’s proven TurboDisc technology, the EPIK700 MOCVD system enables customers to achieve a cost per wafer savings of up to 20 percent compared to previous generations through improved wafer uniformity, reduced operating expenses, and increased productivity. The EPIK700 system features a reactor with more than twice the capacity of current generation reactors. This increased volume, combined with productivity advancements within the reactor, results in a 2.5x throughput advantage over previous generation MOCVD systems. Since the introduction of the TurboDisc K465i GaN MOCVD System in 2010, Veeco has steadily improved its customers’ cost of ownership and became the world’s leading MOCVD equipment supplier. In 2011, Veeco launched the industry’s first multi-reactor MOCVD system, the award-winning TurboDisc MaxBright(R) MOCVD System. In addition, Veeco’s MOCVD TurboDisc technology has been recognized as best in the industry by LED trade associations in each year from 2011 to 2013. According to a recent IHS Research report, LED unit penetration is expected to reach 15 percent in such key markets as China, Japan, North America and Europe by 2016 and more than double to 40 percent by 2020. Veeco’s new breakthrough EPIK700 MOCVD system is the LED industry’s highest productivity MOCVD system that reduces cost per wafer by up to 20 percent compared to previous generations. Available in one-and two-reactor configurations, EPIK700 features breakthrough technologies including the new IsoFlangeTM center injection flow and TruHeatTM wafer coil that provide homogeneous laminar flow and uniform temperature profile across the entire wafer carrier. These technological innovations produce wavelength uniformity to drive higher yields in a tighter bin. EPIK700 offers a 2.5x throughput advantage over other systems due to its large reactor size. Designed for mass production, EPIK700 accommodates 31×4″, 12×6″ and 6×8″ wafer carrier sizes. Customers can easily transfer processes from existing TurboDisc systems to the new EPIK700 MOCVD platform for quick-start production of high quality LEDs. Because of the flexible EPIK700 MOCVD platform, more upgrades, added benefits and future enhancements will continue to differentiate this world-class system.